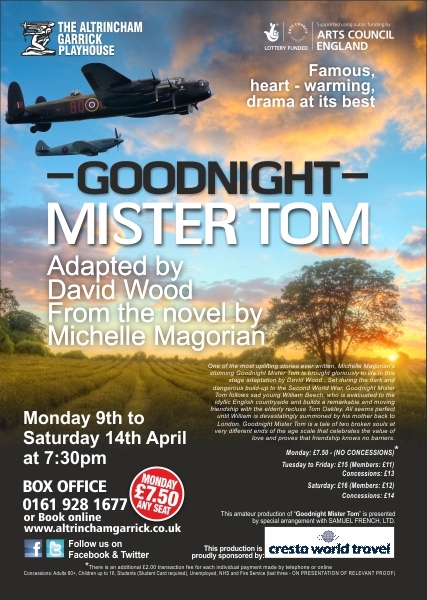 FEW plays pull at the heart strings as much as the Garrick?s latest production, Good Night, Mister Tom. It is a demonstration of love between two people of different generations and very moving. This play is set at the start of the Second World War and features an evacuee from the London docks who is billeted with a grumpy old man in a rural village. It illustrates the power of love. In the case of Tom Oakley ? gone for forty years since his wife died ? and never awakened for William Beech, the deprived young evacuee. Although all the cast are good, including five other children, the production?s success rests predominantly on the shoulders of two people ? Bryan Higgins as Mr Tom and 12-year-old Benoit Normand, who attends St Bede?s school, as William. Bryan brings out the qualities of an old man who has kept his heart of gold hidden for too long. Benoit portrays well, a battered and bruised boy who has had religion pushed down his throat under threat of beating. His unhinged mother even packs a Bible and a belt to take away. Benoit makes his character slowly open up as he responds to the kindness and care he is offered. Bryan?s Mr Tom begins to take on parental responsibilities even kidnapping him when his mother takes him back. I like Caroline Knight as the gone to the winds mother, Henry Thorman as Zach, William?s theatrical type best friend and young Frances Hartill. who manipulates Sammy, the puppet sheepdog throughout. This show, ideal for older children, is as thought-provoking as it is charming. The atmosphere is enhanced by appropriate background music, lighting and sound reproduction. * Good Night, Mister Tom, is at the Garrick Playhouse until Saturday. For tickets telephone 0161 928 1677 or book online at altrinchamgarrick.co.uk. Altrincham Garrick Playhouse transformed to become the Devon village of Little Weirwold the home of Tom Oakley back in September 1939. This play has been adapted by David Wood from Michelle Magorian?s wonderful novel. This amateur production is wonderfully directed by Andrew Close and designed by Margaret Norris. Lighting is in the hands of Stuart Kilburn with sound provided by James Merrington. The first character we meet is the Billeting Officer played by Ruth Metcalfe who has been acting at the Garrick for many years. As she marches the evacuees around the village and to the home of Tom Oakley. Tom Oakley is superbly played by the NODA nominated Bryan Higgins, and he is left with little William Beech. Benoit Normand (12 years old who attends St Bede?s College) portrays William brilliantly and with great emotion when required. Tom has a collie dog called Sammy who was made by freelance puppeteer Jamie Marks (for further information about Jamie visit http://jamaniace.wixsite.com/jm-puppets ) and is skilfully brought to life by 11 year old Frances Hartill. Charlie Ruddles the local air raid warden is played by Gino Scrigna, with Rose Higgins playing the bubbly Mrs Fletcher. William is teased by village children Carrie (11-year-old Olivia Streeter from Sale), Ginnie (11year old Kitty McGoff from Altrincham) and George Fletcher (10-year-old George McGoff) all three are stars in the making, handling appearing on stage with aplomb. The other evacuee that we meet is Zach (brilliantly played by Henry Thorman who is in his first year at St Bede?s College) who is a very confident lad who makes the audience chuckle along. Doctor Little is played by David Baxendale who is in his third production at the Garrick David also takes the role of Mr Miller, who runs the post office along with his daughter Miss Miller (Holly Gibson who has been involved in local drama groups from the age of 4). School teacher Mrs Annie Hartridge is wonderfully played by Mollie Rowley (a junior doctor away from acting, this is her first production at the Garrick). The other characters we meet in the 2nd half are William?s mother the terrible Mrs Beech played beautifully by Caroline Knight and the Social Worker played by Hannah Weiner. The play is well put together and condenses the film down without losing the essence of the story. The set changes are relatively smooth with a little bit of visible movement of the scenery, but this is to be expected from an amateur production who don?t have the vast budgets to build robust back drops. The acting especially from the young characters is very good and the emotion comes out between Mister Tom and William. ONLY the heartless would fail to be touched by this one, a heart-warming tale faithfully adapted for the stage by David Wood. An elderly widower re-discovers his appetite for life after a young and vulnerable evacuee is senl to live with him in his idyllic Devon village. William, the little lad in question, is nursing the physical and psychological scars of abuse at the hands of a mentally ill mother fixated on religion. Gradually, an unlikely bond builds between William and Tom Oakley, his new carer who actually cares for him, and this is expertly played out by Bryan Higgins (Tom) and Benoit Normand (William). Higgins has a deep seated affection for this delight of a role and it’s plain for all to see. I also challenge anyone not to warm to Henry Thorman’s Zach, a character as loud as the jumper he wears. At the other end of the spectrum we have Caroline Knight, positively hateful as William’s crackpot of a parent, a woman who’d make most puritans seem like party animals. This is the ideal opportunity for parents to introduce older children to the theatre. While Goodnight Mister Tom doesn’t gloss over the human tragedy of war, we are reminded that even in this chocolate box Devon village the residents aren’t immune from it, this play touches on the subject in such a way that won’t give the kids nightmares. So, I heartily recommend parents buy tickets for this as an Easter holiday treat for their youngsters. Director Andrew Close serves up a production that tugs the heart strings without seeming to try. This amateur production of ?Goodnight Mister Tom? is presented by special arrangement with SAMUEL FRENCH LTD.